Approximately 1000 meters of enclosed garden for the exclusive use of your animals. Discount depending on length of stay.Ideale to spend a peaceful holiday immersed in nature, surrounded by a splendid panorama, a typical Tuscan. At about 35 km from the most beautiful beaches in Tuscany, Marina di Castagneto Carducci, Follonica, Baratti, Populonia. Ideal for a view of the island of Elba in the day about 40 km from the port of Piombino. A place worth visiting is the Monastery of San Pietro in Palazzuolo which is the oldest surviving town in the area. The monastery is now in ruins, although some of its parts remain intact . The Church of San Lorenzo in the town square of Canneto dates back to eleventh or twelfth century and is still well-preserved . Worth a visit the Church of St. Andrew of medieval origin and recently renovated and the Oratory of the Blessed Sacrament dating back to 1751. 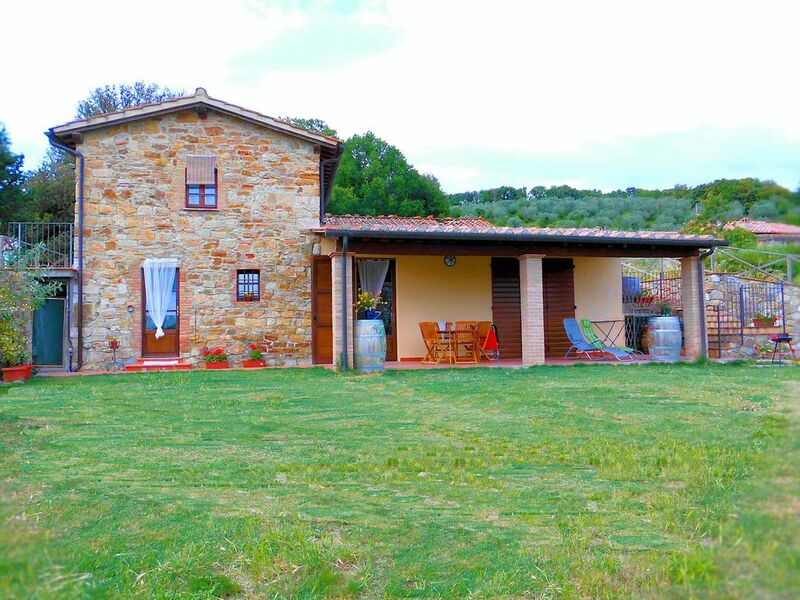 Situated in a great location easy to explore the valleys of Tuscan. The host Andrea is very accommodating and helpful. Thank you Sonia thank you Rob , I hope that you will come back soon to meet us , I recommend them with priority, they are really beautiful people!!!! Andrea und seine Mama sind extrem nett und zuvorkommend. Wir haben unseren Aufenthalt sehr genossen. Das kleine Dorf ist schön, alle sind freundlich, auch wenn wir nur spanisch, französisch, englisch und deutsch anbieten konnten. Beim nächsten Besuch packen wir italienisch für Anfänger noch drauf. Schönes Objekt genau das Richtige für Menschen die Ruhe und Erholung wollen. Komplett eingerichtet, alles da was man benötigt, sehr freundliche Vermieter. In das Dorf gelangt man zu Fuß in ca 20 Minuten bergan, dort gibt es alles was man für den täglichen Gebrauch benötigt. Wir haben uns sehr wohl gefühlt. Tutto molto bello. Posto tranquillo. La casa e il luogo molto tranquillo. Per i cani e stato perfetto e la casa era dotata di tutto il necessario. Andrea e sua mamma molto gentili come le persone che abitano questo paesino. Abbiamo trovato posti molto belli. Se ci fosse stata la piscina era perfetto. Ringrazio Silvia e i suoi splendi figli per avere passato le loro vacanze nella nostra casa, quando vorranno tornare saranno sempre i benvenuti. Per la piscina è in programmazione vediamo per il prossimo anno. Li raccomando con priorità. Un grande abbraccio a tutti. Vi auguro tutto il meglio. Eine schnuckeliges kleines Häuschen, mit einer sehr guten Ausstattung. In der Küche findet man alles was man so braucht. Die Terrasse ist mit schönen Gartenstühlen zum entspannen ausgestattet. Ein Grill ist vorhanden und eine Quelle wo man nach Belieben frisches Wasser holen kann. Der Ort Monteverdi ist ein kleines, nettes toskanisches Dörfchen. Der Lebensmittelladen ist ein Muss für Käse und Schinken (Wildschwein) Fans. To reach the village of Monteverdi Maritime in Tuscany by car , follow the road SS 1 south from Livorno and then merge hinterland following the main road SS 329. For those coming from the A 1 instead must come close to Siena and follow the signs to the coast on various roads. By train you can reach the nearby Castagneto from Livorno where are regional buses for this destination. By plane the nearest airport is Pisa. If you have chosen Monteverdi Marittimo to relax, since your arrival you will notice that the nearby sea air mingles with the smells of the countryside and creates the right mix to reach your goal. In a few days you'll probably be so relaxed that you will begin to look for something to do, and what 's better than a stroll along the Tuscan coast ? Nothing . Then harry up and head to the nearby Cecina , where from the seashore you can breathe the sea air and eat the delicious dishes of fish. If you do not like too much the sea you can choose between beautiful excursions to the nearby countryside and very interesting excursions to the nearby cities of Siena , Livorno and Pisa.